If you want to use a physical DMD without the on-screen equivalent, we’ll show you how to do that at the end. 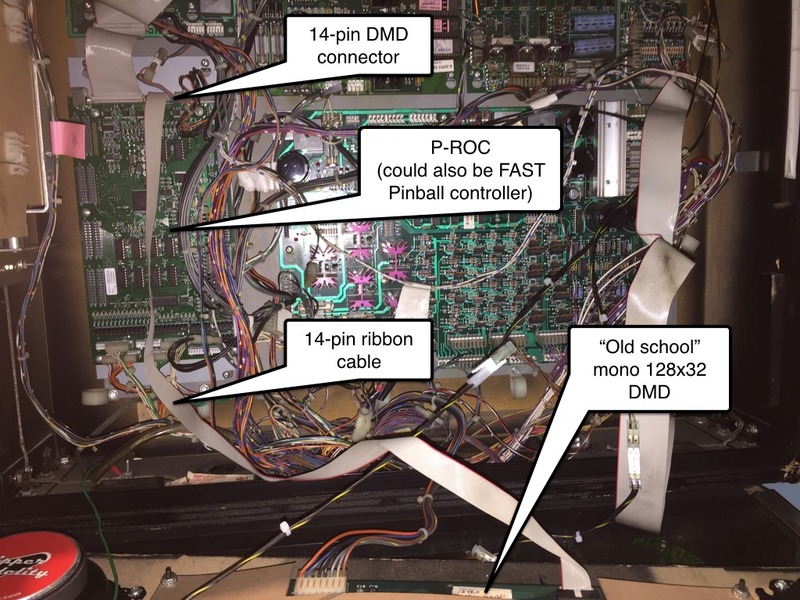 If you want to only have an on-screen DMD without the physical one, like if you want to replace the DMD with an LCD screen but still have it look like a DMD, then read this guide instead. The first part of the config file above is where you create your logical displays like we covered in the Working with Displays section. We’re creating two displays here. The first is called “window” and has a size of 600x200. This will be the display that shows up on the computer screen. The second display, which we’re calling “dmd”, will be the display that provides the content for the physical DMD. This display is 128x32, which is the pixel size of the DMD. Notice that we set default: true for the dmd display. This is because as we’re creating display content in our game, we want it (by default) to show up in the DMD (since that will be the primary display in our game). Note that you don’t set colors or anything here—this is just setting up the logical displays which we’ll use next. Next, we have a window: section which holds the settings for the actual on screen window itself. In this case we’re just configuring it to be 800x600, with a window title of “Mission Pinball Framework”. Check out Step 2. of the LCD guide for more details on this window section, and be sure to check out all the window options in the window: section of the config file reference. Notice that in this case, we did not add the source_display: window setting to this section. That’s because we have a logical display called “window”, and when you have that, the on-screen window will automatically use that display as its source. Now we have a working on-screen window and a working physical RGB DMD. But if you run mpf both now, your on screen window will be blank because we haven’t built any slides to show up. So in this step, we’re going to build a slide for the on-screen window that will be shown when MPF starts. We’ll add some widgets to that slide to make it look like the screen shot at the beginning of this guide. Again, there are lots of options here. Note that we’re adding a height: and width: of 512x128. This is the on-screen pixel size of the DMD as it will be drawn in the window. In this case we chose an even multiple of the source display for the DMD (which is 128x32), meaning that each pixel of the original DMD will be rendered on screen as 4 pixels by 4 pixels. This is big enough to get the circular “dot look” filter to look good, and being an even multiple means that we won’t have any weird moire patterns. For the on screen DMD, we are able to select the pixel color, because this is how the DMD will be drawn on the computer screen, and MPF has no idea what color the actual DMD is. So you can pick any color you want here. We chose ff5500 which is a classic DMD orange color. There are other options listed in the dmd effect documentation to control settings like how big the circles are versus the space in between them, the ability to not have the “dot” filter, and the ability to set the “glow” radius of each dot, color tint, limiting the color palette, etc. Note that in this case, we did not have to add the source_display: option because we have a display called “dmd” which will automatically be used as the source for the color DMD widget. Next, we also added two more widgets to this slide—a text widget with the title of the machine, and a gray rectangle that’s slightly larger than the DMD to give it a nice border. If you don’t have a slide_player: entry in your machine-wide config, go ahead and add it now. Then create an entry for the init_done event. This is the event that the media controller posts when it’s ready to be used, so it’s a good event for our use case. And this point, you’re all set! Of course there’s no content on the DMD yet because we haven’t set up any slide_player entries to add content to it, but that’s something you can do by following the tutorial or looking at the guides for the slides and widgets here. This is fine. To do it, just remove the window-related components from the config. In this case, you wouldn’t need the default: true entry for the dmd in the displays: section because you only have one display, so it will automatically be the default. At this point you have two displays configured, and you have default content showing up in both of them. The final step is to add the configuration for your physical DMD so that MPF can talk to your hardware. The exact steps to do that vary depending on which DMD hardware platform you’ve chosen, so click on the one you have from the list below and follow the final instructions there to get everything set up.